Melothria scabra is a vine grown for its edible fruit. Fruit are about the size of grapes and taste like cucumbers with a tinge of sourness. 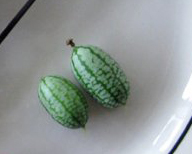 Vernacular names include mouse melon, Mexican sour gherkin, cucamelon, Mexican miniature watermelon and Mexican sour cucumber. This plant is native to Mexico and Central America, where it is called sandiita (little watermelon). It is believed to have been a domesticated crop before western contact began. These plants are slow-growing when they are establishing themselves, but can eventually grow up to ten feet under proper conditions. They are drought resistant and pest-resistant relative to other cucumbers. Similar to the cucumber, these plants produce both male and female flowers. These plants can fertilize themselves, but the flowers are not self-fertile. Flowers are small and yellow, about four millimeters in diameter. Fruits develop at the base of the female flower.